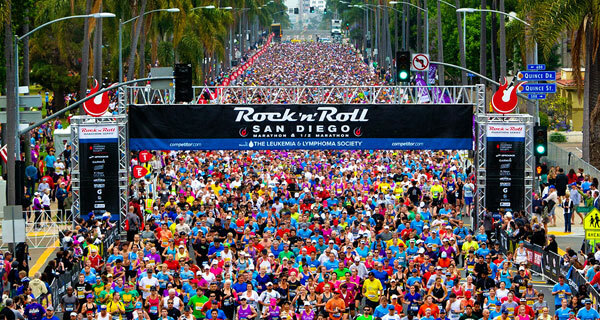 SAN DIEGO, Calif. June 1, 2014 – On the 17th anniversary of the Suja Rock ‘n Roll San Diego Marathon & 1/2 Marathon To Benefit The Leukemia & Lymphoma, at the 13.1-mile distance, youth was served today. And Ethiopians ruled the roads. Nearly 25,000 runners, walkers and wheelchair athletes hit the pavement, entertained by more than 40 bands and 20 cheerleading squads lining the scenic San Diego racecourse. To cap off the day, Aloe Blacc helped runners celebrate their accomplishments with an unforgettable finish line performance inside Petco Park. In the men’s half marathon, 20-year-old Solomon Deksisa of Ethiopia broke away from Kenyan Geoffrey Bundi near mile 11 and sped to victory, winning in 1 hour, 12 seconds. Bundi, 26, finished second in 1:00:28, which was over a 2 minute PR and the fastest half-marathon run on U.S. soil this year. Three-time Boston Marathon champion Rita Jeptoo, 33, of Kenya soaked up the pre-race hype before toeing the half marathon start line. But on a humid morning with temperatures in the 60s, it was 20-year-old Ethiopian Birhane Dibaba stealing the show. About 50 meters from the tape on the downhill finish, Dibaba pulled away to win in 1:09:34. Jeptoo settled for second in 1:09:37. 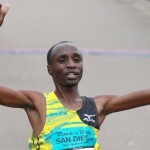 And while African runners dominated the 26.2- and 13.1-mile distances, the most popular athlete on the roads was a San Diegan. Boston Marathon champion Meb Keflezighi, who attended junior high and high school near the course, lined up in the half marathon. Meb—like Kobe and LeBron, he’s recognized simply by his first name — but he wasn’t racing. 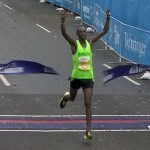 Instead, he paced runners trying to break 1 hour, 30 minutes. As he did at his emotional April performance in Boston when he became the first American male to win in 31 years, Meb didn’t disappoint. Drafting off Meb and motivated by his encouragement, numerous runners set half-marathon personal records. Hayden Greenawalt, 23, of Oklahoma finished just under 1:28. Her previous half marathon best: 1:30:45. Cristen Patton, 32, of Temecula, Calif., woke up today with a 1:31 PR. Today’s time: 1:29. Ben Bruce hasn’t competed in many marathons over the course of his professional running career, but he’s quickly gotten the hang of winning 26.2-mile races. Lining up for his second marathon of the year—and his career—the San Diego native and led from start to finish to win the Suja Rock ‘n’ Roll San Diego Marathon in 2 hours, 23 minutes and 50 seconds. In February, Bruce won his debut at Rock ‘n’ Roll New Orleans in 2:21:56, but for the 31-year-old, nothing tops winning in his hometown. In the women’s race, the first time was the charm for Anna Corrigan of Phoenix. Running in her debut marathon—and her first race over 10K—the 23-year-old broke the tape in 2:44:28 to finish 3 minutes and 10 seconds up on second-place finisher Bonnie Axman, 29, of San Diego. While Bruce’s winning marathon time of 2:23:50 was impressive, it was 91-year-old Harriette Thompson (pictured, above), from North Carolina, who stole the show by finishing the marathon in 7:07:42. Thompson, who is a cancer survivor, became the second oldest marathon finisher in U.S. history and set a new age-group record. Both races started in historic Balboa Park and finished at Petco Park, the home of the San Diego Padres. Across the event’s 17-year history, runners have raised nearly $176 million for the race’s title charity, the Leukemia & Lymphoma Society.